Illustration lovers, get set to gasp. Herewith--contemporary illustrator heaven--mapped out in a luscious hard cover tome that will send you dizzy. Covering the decades from the 1960s (Utopian Idealism) through the 1970s (Decade of Discontent), the 1980s (Designer Decade), the 1990s (Digital Dawn) and the 2000s (A New Wave), this amazing book takes an historical, sociological, political and cultural peek at each decade, beautifully paralleled by illustrators. Touted as 'people's art', illustration in the 21st Century has experienced a resurgence in general usage, from books and advertising to television and film, and it's little wonder given the advances in technology that allow this medium to be used in new and exciting ways. As such, it continues to have an enormous influence on design and popular culture. 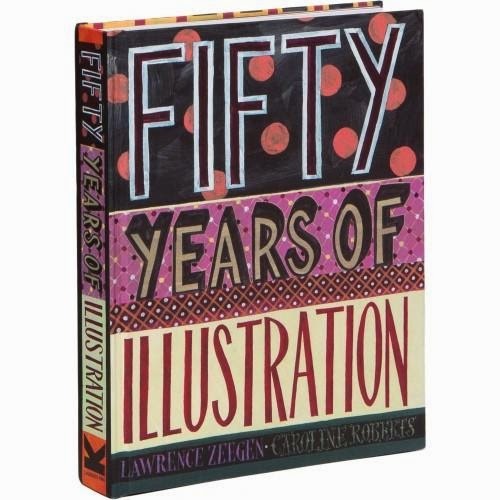 Fifty Years of Illustration is a satisfying reflection on where it has been and where it's going. Adults and older children will be fascinated by its contents--not only artistically, but in terms of pop culture and social change. As each decade is explored, the work of featured artists helps tell a most fascinating 'story', Joe Demer's Sports Illustrated covers from the '60s to Shepard Fairey's offset lithography of Barrack Obama's presidential campaign, entitled Obama Hope (2008). Other artists include Takashi Kono, Maurice Sendak, Klaus Voormann, Philip Castle, Raymond Briggs, Jan Pierikowski, Quentin Blake, Sara Fanelli, Paul Blow, Aurelien Arnaud and Otto Dettmer. Interestingly, the choice of artists is very heavily male-driven. This is probably due to the saturation of male artists working in advertising and pop-culture, particularly during the earlier decades. A breathtaking peek at modern life in the most delightfully visual way.